Your trust is important to us and we at Musicline Publications Limited take your privacy very seriously. We treat information provided by you with the utmost care and take appropriate steps to protect your data. Any personal information that you submit on our website will be stored and processed securely and will not be released to any other organisation. We will always endeavour to comply with the requirements of the General Data Protection Regulations (2018), The Privacy and Electronic Communications Regulations (2003) and other UK and EU consumer protection legislation. 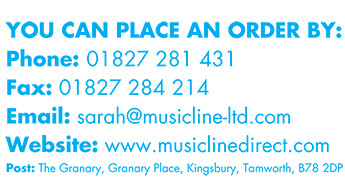 The information supplied by you when you register or shop on our website will be retained by Musicline Publications Limited on a database and will be used to process and despatch your order, to update our records and to contact you with information about relevant products, services or opportunities that we believe might be of interest to you. In order to process your order we may need to disclose your personal information to credit card companies, data processors and service providers. In order to keep you informed about relevant products or services we will on occasions send you an email. You can request that we do not send any emails to you by unsubscribing at any time. Musicline Publications Limited is the Data Controller for your information. If you have any questions about this, please contact us. Our website uses "cookies" for authenticating, tracking, and maintaining site preferences for visitors. The information collected in this way is used for analysing the effectiveness of website design and advertising, and in verifying the identity of registered users. Cookies are small text messages that are stored by your web browser and sent back to the originating web site each time you visit. They do not contain any personal information and can be disabled in your web browser software. Our website uses Google Analytics, a web analytics service provided by Google in order to monitor general website usage. Google Analytics only collects anonymous data, not personal data. Google Analytics also uses "cookies", in accordance with the terms of their privacy statement (http://www.google.com/privacy.html).